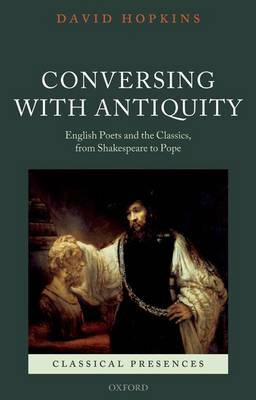 Conversing with Antiquity collects, in a substantially revised and updated form, studies of the reception of the classics by English poets of the seventeenth and eighteenth centuries by one of the leading scholars in the field. A new Introduction locates the book's investigations within the context of current debates between aestheticians and cultural historians about the reception of classical culture. Where some recent studies have regarded English poets' dealings with the classics as acts of 'appropriation', or even 'colonialization', David Hopkins emphasizes the element of dialogic give-and-take in the relationship between these poets and their classical peers. He argues that, rather than simply 'updating' or 'assimilating' the classics to their own cultural norms, poets such as Abraham Cowley, Lucy Hutchinson, Thomas Creech, John Milton, John Dryden, and Alexander Pope engaged in trans-historical conversation with Greek and Roman poets, in which self-discovery and self-transcendence were as important as any simple 'accommodation' of ancient texts to modern tastes.